Welcome to the new FLIPBOOK AGE ~ for traditional Artists, Animators & Creative Types of all ages! "Raising the artform of personal flipbooks to the next level!" Most people believe you need expensive computers and software to create good animation. However nothing could be further from the truth. DRAWTASTIC has gone 'back to the future' and raised the art of the animated flipbook to the next level! Through our FLIPBOOK FUN books you can actually learn animation as you have fun creating your own hand-drawn flipbook. You could go further by obtaining a wonderfully-retro FLIPBOOKIT device of your own, to cinematically present your animation to family, friends and clients? And you could even win a coveted 'Golden Pencil Award' by entering your work into our DRAWTASTIC Festival of Drawing & Animation flipbook film competition. The sky - and your imagination - is your only limit! Clearly this is a perfect gift for anyone who loves to draw, build and make things move through the power of imagination! Abbie Wilson. She was just 9-years-old when she created this! 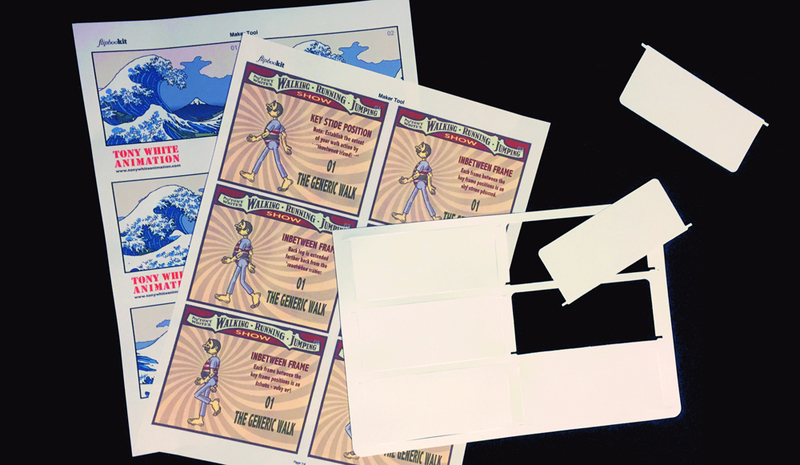 The fun starts when you purchase your own printed FLIPBOOK FUN book! All the basic moves of your chosen theme are plotted out for you on the left-hand page, so all you need do is draw your own character on the page to the right, matching those poses as best you can. ​There are a range of FLIPBOOK FUN themes in production with the first two ~ 'Walk the Walk' and 'Run like a Roadrunner' ~ currently available! The FLIPBOOKIT is a wonderfully retro-style, box camera-like device that enables you to screen your animated action to family, friends and clients at a moment's notice. FLIPBOOKITs come in 2 colors and even offer an option of a push-button, battery-driven operation if ease of presentation is preferred. The FLIPBOOKIT comes with a pre-installed, vintage horse action set of flipbook cards included. 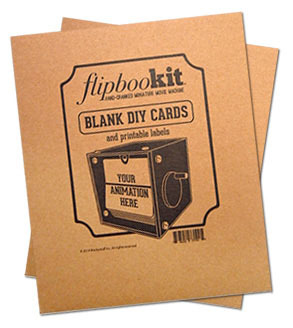 But if you want to transfer your own FLIPBOOK FUN action to it you'll need a BLANK DIY CARD pack too. Current FLIPBOOKITs available: ORIGINAL (Black finish) & CRAFT (Brown finish). Note: For those choosing not to draw their own flipbook animation, you can also transfer short home movie videos to the FLIPBOOKIT device as well! The best value for money we can offer flipbook fans is our discounted ECONOMY FUN PACKAGE. This package includes a full 'CRAFT' (Brown finish) FLIPBOOKIT, a full set of BLANK DIY CARDS and a 'Walk the Walk' FLIPBOOK FUN book. Note: 'ORIGINAL' FLIPBOOKIT (Black finish) ECONOMY FUN PACKAGES are available on request. More serious flipbookers might like to consider the ECONOMY PRO PACKAGE, which contains everything the ECONOMY FUN PACKAGE contains but also includes a How To Animate Tony White tutorial sheet with its matching set of FLIPBOOKIT cards. Note: The only tutorial currently available is for a 'Generic Walk' action. However further tutorial theme packages will be added as time goes by. If you want to learn how to create a perfect basic walking action in animation, master animator Tony White offers exclusive 'WALKING, RUNNING, JUMPING SHOW' flipbook cards and text tutorials to teach you how. The card action demonstrates - frame-by-frame - how a perfect generic walk should look, while the accompanying text tutorial notes explain the process in greater detail. (You will of course need a FLIPBOOKIT device of your own to view the moving action.) Further action themes will be added to the series in time, ultimately creating the simplest, most accessible & extensive collection of animation tutorials ever.